Home » 30s » Airship LZ 127 Graf Zeppelin, Vogtland ride. Airship LZ 127 Graf Zeppelin, Vogtland ride. German Airship LZ 127 Graf Zeppelin, Vogtland ride. Postcard 1930. The German air “Graf Zeppelin” LZ 127, when landing in Vogtland. 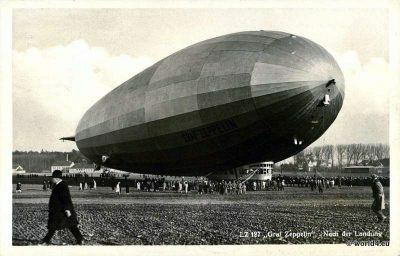 Next PostGerman airship LZ 127 Graf Zeppelin. Postcards 1928.